Fibrogastroscopy (FGS, EGD) is the most important diagnostic method for the detection of diseases of the stomach and initial segments of the duodenum (peptic ulcer disease, gastritis, duodenitis, etc.). 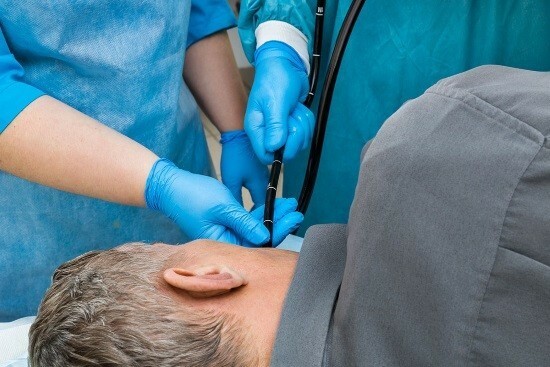 The use of the endoscope leads to a variety of local negative effects, one of which is the complaints of patients that a sore throat after the EGD. However, the patient can avoid these complications by following certain rules of preparation for the procedure, and following a special diet after the test. Many patients wonder why a sore throat after a gastroscopy? Most often, you may get a sore throat from ordinary mechanical impact on the mucous membrane of the oral cavity and larynx. By itself, the endoscope is a small flexible tube with a sufficiently rigid wall in which it is promoted through the mouth into the esophagus and further down the digestive system. The solution of chlorhexidine is a good antiseptic to reduce infection of the mucous membranes and, thereby, reduce the intensity of the inflammatory process. Is the best option for treatment scratched mucosa after EGD. Miramistin – analogue of chlorhexidine, quickly destroying various types of microorganisms. Solution furatsilina operates in a similar manner, but is usually prepared independently by the patient before use. The use of local antiseptics allows to disinfect mucous membranes, damaged by treatments and stop the progression of the inflammatory process. With the appearance of pain syndrome it is best to consult your doctor for examination of the mucosa and selection of rational therapy. If the pain softly pronounced, your doctor may advise you to use tablets with local anesthetic effects (Stopangin, etc.). Their effectiveness in the treatment of such pain with a weak inflammatory components is quite high. Throat after the EGD may become ill due to improper nutrition. As a rule, patients do not recommend at all to eat in the first 3-4 hours after the study. However, in the future is necessary. Any spicy or hot food should be deleted, as they quickly lead to additional damage to the mucosa of the larynx and to the progression of the inflammatory process in it. The addition of large amounts of spices and seasonings in the food is unacceptable for the reason articulated previously. Smoked, salty or fatty foods can also worsen inflammation and provoke pain in the throat after the EGD. Proper diet can reduce the risk of inflammatory complications. It is desirable to exclude all «heavy» food. The optimal diet in the first days after endoscopic examination should consist of cereals, or steamed vegetables. Hard food may injure mechanically is additionally the inner lining of the larynx. For the same reasons it is not recommended to drink hot drinks or alcohol. Prevention of pain in the throat after the EGD is done through proper preparation of the patient for the procedure and explain to him the rules of power after it. Possible prophylactic treatment of oral cavity and laryngeal mucosa antiseptics to prevent bacterial growth. If patient develops sore throat after the EGD, it is recommended to consult your doctor for examination and selection of optimal treatment. As a rule, such a pain syndrome go away on their own in the first days after the procedure and does not require the use of any special tools, in addition to diet. Proper prevention of this complication allows to completely prevent its development.